The event happened on September 3, 2014, between 4:31-4:33 UT (the evening of September 2 in local time) and was seen from Colorado, Wyoming and New Mexico. A very slow fireball, with a duration of at least 40 seconds and variable in brightness in what looks like a semi-regular pattern, moved across almost 180 degrees of sky. It penetrated deeply into the atmosphere, leaving a debris cloud at low altitude lingering for 30 minutes, detected by Doppler weather radar. Initially seen as a meteor event, it was somewhat ignored by the amateur satellite community until brought to their attention a few days later. The suspicion arose that this was in fact a satellite re-entry, with the prime candidate being Kosmos 2495 (2014-025A), a Russian Kobalt-M/Yantar 4K2M photoreturn spy satellite. This is a satellite that uses analogue film rather than electronic image sensors. The exposed film is returned to earth in three recoverable return capsules, the last of which also returns the camera (for re-use). 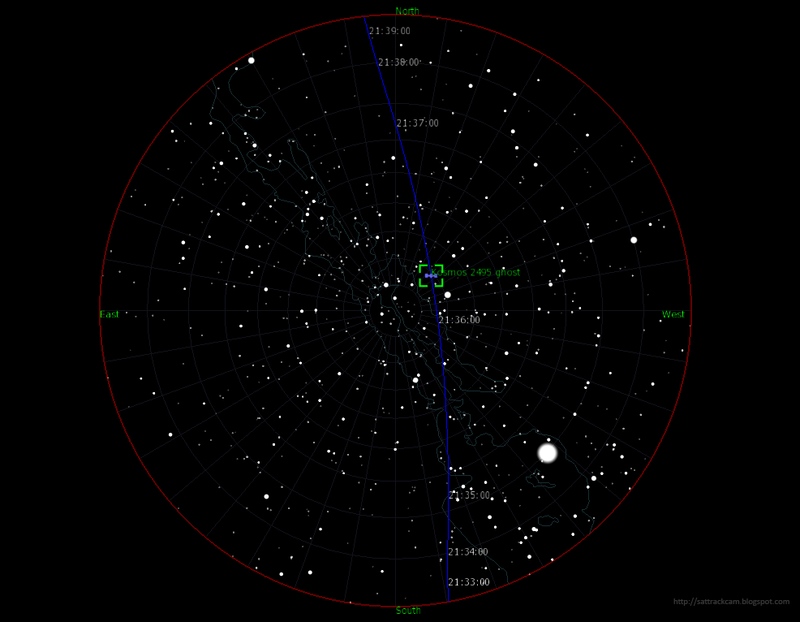 Timing and path over the sky however closely match predictions for Kosmos 2495. The observed object passed only ~3 minutes earlier than the predicted pass of the satellite, in a very similar trajectory. This actually fits with a decay, as in a lower orbit the object starts to slightly speed ahead of an object in a similar but higher orbit. The slight eastern displacement of the sky track also fits with this: in a few minutes time, the earth rotates under the orbital plane slightly, displacing the sky track westwards. As this satellite should have been in earth shadow at that time of the event and hence not illuminated by the sun, it is immediately clear that if this was Kosmos 2495, it was in the act of re-entering and already producing a plasma envelope (a fireball). But why? The last known orbital element set for the satellite with epoch 2 Sep 17:12 UT show it at an orbital altitude too high for an imminent natural decay. JSpOC however issued an "administrative decay" for the satellite early on September 3, an indication that it has been deliberately de-orbited. Yet it was unlikely that the Russian military intended this satellite to re-enter over the USA instead of over Russia itself, or over the Pacific. So, if this was Kosmos 2495, did something go wrong? It initially looked like it. Then came the confusion. On the Seesat-list, Ted Molczan reported having received reports of sightings of a re-entry earlier that same day, near 18:14 UT on September 2, seen over southwest Kazachstan. A number of video's exist of this event and show a glowing object followed at some distance by a cloud of glowing fragments. The location of these observations, timing and general direction fits well with an object on a trajectory to Orenburg in Russia, the designated touchdown locality of the Kobalt-M re-entry capsules. Indeed, the timing of the observations (~18:14 UT) matches a pass of Kosmos 2495 over the area, and the trajectory of the latter indeed brings it over Orenburg near that same time. So if this was the Kosmos 2495 re-entry over southwest Kazachstan and the Kaspian sea, then what was it that re-entered over the USA 10 hours later? Next, the Russian military weighed in and flatly denied that anything went wrong with Kosmos 2495, implicitly suggesting that the object decaying over the USA was not their satellite (spoiler: it nevertheless likely were parts of the satellite, see below). For a solution of this confusion, we have to look at the construction of a Kobalt-M satellite, and previous Kobalt-M missions. An excellent and detailed description of the Yantar/Kobalt satellites translated from a Russian publication can be found here on Sven Grahns website. 4) a 2.5 meter sun shade with additional antennae and sensors on the tip of the OSA, that is presumably jettisoned at re-entry. The satellite also has two additional small re-entry and landing capsules for the recovery of film mounted on the side of the OSA: these are jettisoned for re-entry at 1/3rd and 2/3rd into the mission, so should no longer have been present on Kosmos 2495 on September 2. Of importance is that the OSA re-entry module eventually separates from the satellite for re-entry. This potentially leaves satellite parts in orbit after the OSA re-entry, even though it is generally believed that the AO and PO go down with the OSA, with the AO providing the retrofire burn for the de-orbit of the OSA. The event seen from Kazachstan was, given the location and timing, most likely the OSA return vehicle with the camera and film re-entering the atmosphere for recovery at Orenburg. The single object in front visible in the videos is likely the returning OSA itself. The cloud of fragments at some distance behind it, might be the jettisoned sun shade disintegrating in the atmosphere. It could also be the AO (propulsion) module, the PO module, or both (it is believed by analysts that the AO (propulsion) module is providing the retrofire boost necessary for the de-orbit of the OSA re-entry vehicle. It is believed that the OSA does not have its own retrofire rocket). How does this fit in with the observations over the USA 10 hours later? Of interest is that these debris pieces are only detected at the very end of the Kobalt-M mission, around the time of the OSA return vehicle re-entry at Orenburg. They hence seem to have to do with alterations to the satellite in preparation for the OSA separation and re-entry. As it happened on at least five of the missions, it seems a normal element of these missions. In fact it might have happened on all missions, but not all might have been detected: most of the objects above have only one or two element sets released indicating short detection spans. Their lifetimes typically are no more than a few hours to a day, so they can be missed. From the catalogued orbits of these debris pieces, there are suggestions that the separation of these objects from the original satellite body actually happens a few hours before the OSA re-entry. For Kosmos 2410, this is very clear as the debris pieces were first detected some 16 hours before the OSA re-entry, and while the A-object (presumably containing the OSA) was still being tracked. 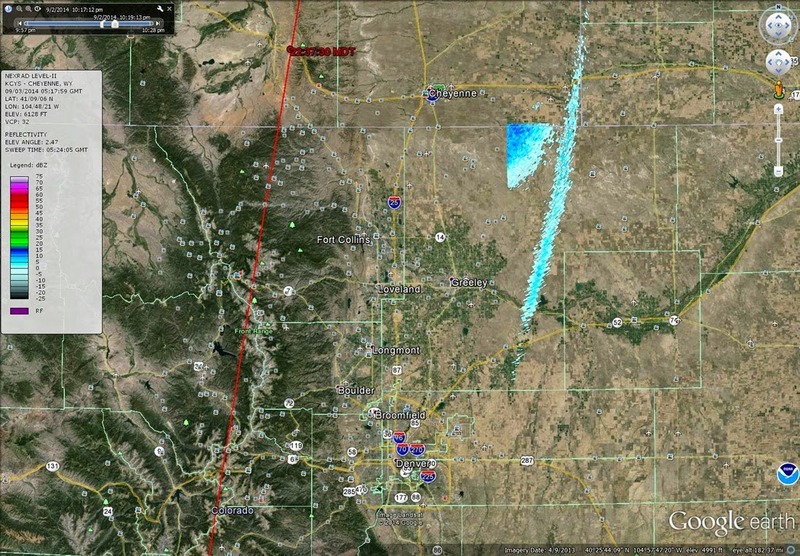 The likely re-entry seen from Wyoming, Colorado and New Mexico 10 hours after the OSA re-entry vehicle return over Orenburg, could very well concern similar debris pieces generated by Kosmos 2495. Analogues from another Kobalt-M mission suggests this is a realistic option. Kosmos 2445 (2008-058A), another Kobalt-M mission from 2009, provides a very nice analogue. On its last day of existence it produced two debris pieces with catalogue numbers 33969 and 33970, that survived for several hours after the OSA re-entry. The OSA return occured on 23 Feb 2009 at 16:15 UT. We know this because this OSA re-entry was observed, as reported by Lissov. 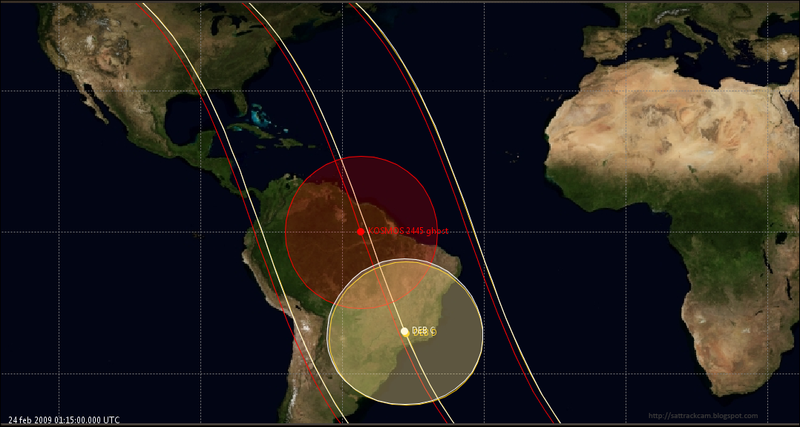 The last available tracking data for the two Kosmos 2445 debris pieces have an epoch near midnight of Feb 23-24, 2009, indicating survival for at least 8 hours after the Kosmos 2445 OSA return at Orenburg. I have used Alan Pickup's SatEvo software to further analyse the likely decay time for these debris pieces: the analysis suggests decay near 1:30-1:40 UT on 24 Feb, 2009. This is 9.5 hours after the OSA return. This 9.5 hours survival time of the Kosmos 2445 debris pieces is similar to the time difference between the Sep 2, 18:14 UT Kosmos 2495 OSA return observed from Kazakhstan, and the possible decay event observed over the USA at Sep 3, 4:30 UT. The time difference between these is about 10 hours, which is not much different from the ~9.5 hours for the Kosmos 2445 debris in 2009. During their last few orbits in February 2009, the Kosmos 2445 debris pieces C and D moved somewhat in front of where the A-object (the part including the OSA re-entry module) would have been had it not been de-orbitted. The difference in pass time was a few minutes. This again provides a nice analogue to the September 2-3 event over the USA: the decaying object observed from the USA moved along the Kosmos 2495 A-object trajectory, but passing 2-3 minutes earlier than the predicted A-object passage (i.e., it was moving slightly in front of where the A-object would have been had it not been de-orbitted over Orenburg). Also note the slight westward displacement of the A object (red) trajectory. So: likely Kosmos 2495 debris re-entering over the USA after all! I feel that this all justifies to conclude that what was seen from the USA on the evening of September 2-3, indeed were parts of Kosmos 2495 re-entering. The close agreement of the observed fireball track with the predicted trajectory and predicted pass times for Kosmos 2495 is too good to be likely coincidence. The whole event moreover fits patterns of previous Kobalt-M missions, notably that of Kosmos 2445 in 2009: debris pieces surviving for a few hours after the OSA return vehicle re-entry, decaying ~ half a day later. So while it was not the return capsule with the camera and film that re-entered over the USA, it were nevertheless almost certainly parts of Kosmos 2495. Remember that denial (see another version here) by the Russian military? Read it carefully. What they actually deny is that Kosmos 2495 exploded, and they say "that nothing out of the ordinary happened". That is true. The return capsule separated successfully and presumably landed safely at Orenburg near 18:14 UT, as observed from Kazachstan. And Kosmos 2496 did not explode over the USA: debris parts left after the OSA separation decayed over the USA. Generation of such debris pieces seems to be normal for a Kobalt-M mission. So yes, "nothing out of the ordinary happened". It is all a clever word game. What the nature of those debris pieces generated at the end of most (if not all) Kobalt-M missions and probably seen decaying over the US exactly is remains unclear. Behind the scenes, several independent analysts including me have had e-mail discussions about this the past 24 hours. Separation of the Kosmos into three modules (AO, PO and OSA), one of which (the OSA) makes a controlled re-entry over Orenburg for recovery, would make you think the remaining two debris pieces are these two other modules, the OA and PO. However, it is generally believed that the AO/PO combination provides the retrofire necessary for the OSA de-orbit and hence goes down with the OSA. It is believed that the OSA module itself has no retrofire capacity (if it would have, it would separate from the other modules and then fire its own retrorocket, leaving the other two modules in orbit). So analysts have proposed that the debris pieces instead are satellite parts like solar panels (which are 6 meters in lenght each) and antennae shed somewhat before the OSA re-entry. That idea is more likely yet in itself not entirely unproblematic either. In the case of Kosmos 2410 in 2005, the debris pieces were generated at least 16 hours (if not more) before the OSA reentry. It seems somewhat unlikely that you shed power sources (solar panels) and communication equipment (antennae) so many hours before the OSA re-entry. The observations from the USA on September 2-3 suggest a seizable object. This is not small debris, but definitely a large object. So that part of the story remains a bit of a mystery. Dr Bill Cooke of the Meteoroid Environments Office at NASA's Marshall Space Flight Center informed me (and this information is posted here with his kind permission) that their camera systems catched the event from New Mexico. From the data they determined that the object entered with a speed of 7.69 +/- 0.07 km/s. That is too slow for an object in heliocentric orbit (a meteor), but the typical speed of an object entering from Low Earth Orbit. Basically, this confirms that the event over the USA was the decay from orbit of (a part of) an artificial satellite. I thank Dr Cooke for communicating this vital piece of information. Ted Molczan has published an excellent analysis into the area-to-mass ratio's of past Kobalt-M debris, which compares favourable to the area-to-mass ratio needed for Kosmos 2465 debris shed at OSA separation to decay over the US at 4:33 UT. Acknowledgement: I thank Ted Molczan, Jon Mikkel and Jonathan McDowell for the exchange of ideas. Igor Lissov provided valuable data on the Kazakhstan sightings and earlier sightings of Kobalt-M OSA re-entries from that region on Seesat. Rosetta's landing spot. In 3D. Woah!